Affectionately earning the title ‘McLauren,’ Lauren joins the Plan B team as the account executive for McLaren. No stranger to the automotive industry, she brings over two years experience working at Pinnacle Advertising on Tier II Honda and Acura advertising. While at Pinnacle, she worked on numerous winning new business pitches and assisted in the day-to-day management of the company’s 19 Tier II accounts. 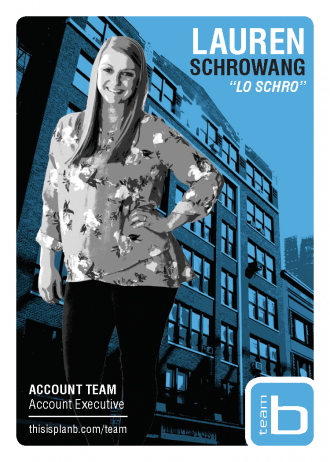 With expertise that goes beyond advertising, Lauren knows how to command a kitchen and is an authority opinion regarding Chicago’s restaurant scene. This self-proclaimed beer connoisseur will take your favorite PBR and raise you a craft beer from the trendiest brewery in town. When she’s not making power moves in the automotive industry, you can find her in the water or the wilderness of beautiful Door County. Lauren graduated from University of Illinois at Urbana-Champaign with a degree in advertising and a minor in communication.